Spring has come in Dublin. The air is balmy, the sun appears occasionally, and hearts are light (when they aren’t laden with apprehension and homework). I leave Ireland in just a little over two weeks, and a week after that I’ll be home! I’m definitely a little sad that I haven’t done everything I wanted to do while I was here, but I suppose that just means I’ll have to come back. 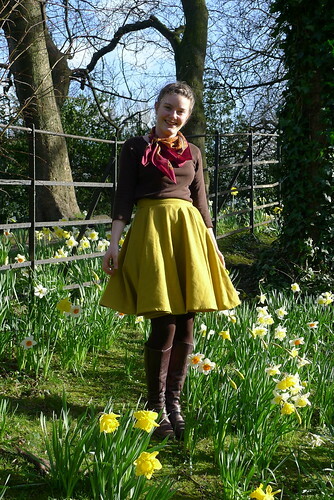 One sunny day a couple of weeks ago, I had my friend Sullivan take pictures of my yellow skirt in St. Stephen’s Green, surrounded by daffodils. Lots of yellow! 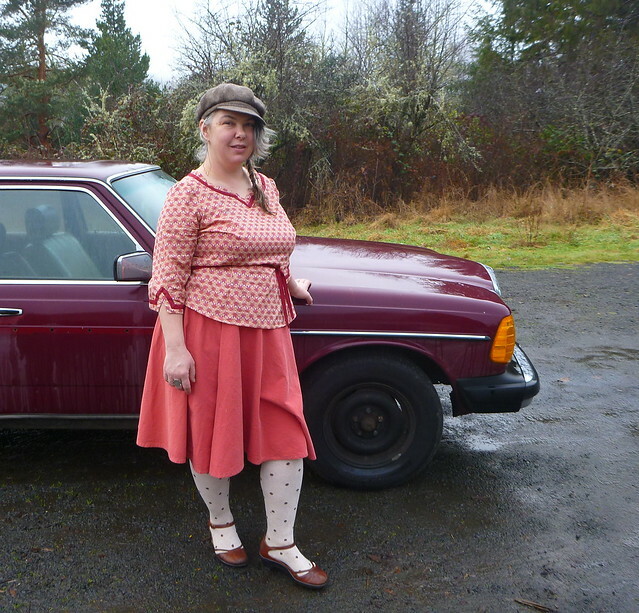 The skirt is a basic circle skirt made of some (unfortunately slightly moth-eaten) wool from my mother’s stash. I made it in a couple of hours at my parents’ house this winter, and since I didn’t have a zipper I opted for a placket and snaps instead. 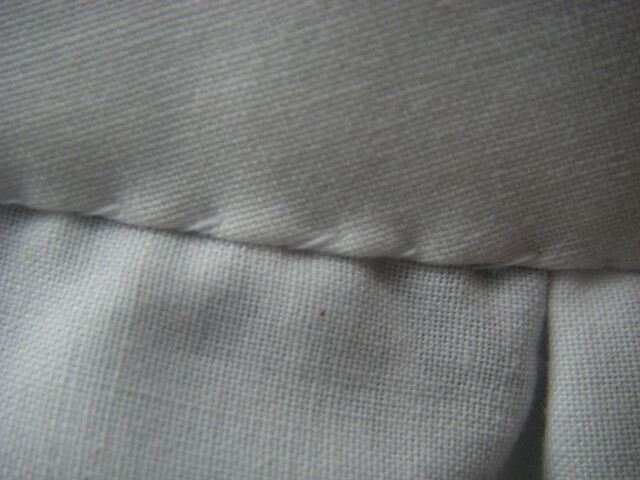 Lucky thing, because the waistband turned out to be too big and the placket made for easier adjustment. 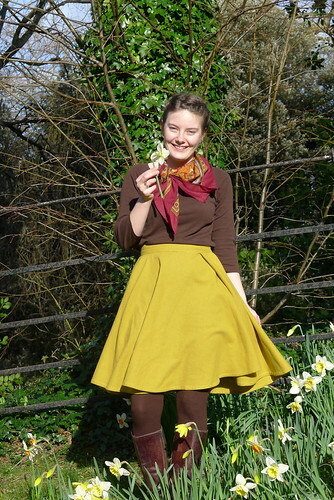 The yellow is not quite the perfect shade of yellow, and for the first couple of months I barely wore the skirt at all! It felt oddly-proportioned and I never knew what to wear it with–I don’t wear black much but didn’t know what else to pair with such a yellow. I was actually thinking of leaving it in Dublin to make more room in my suitcase, but then I found these brown boots in a charity shop for three euros! Having the right shoes made it so much easier to wear. I guess it’ll be traveling back with me after all! There will be loads of new styling options at home, so I’m sure it’ll get a lot of wear. 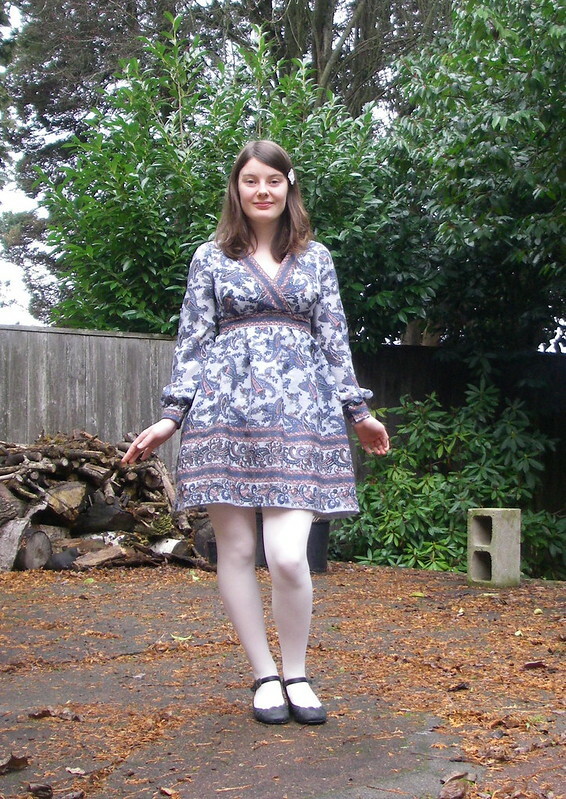 This entry was posted in sewing and tagged dublin, sewn, skirt on April 5, 2014 by Alice. Well folks, it’s my first(ish) post on the new blog AND my first post from Dublin, where I’ll be living until mid-April! How thrilling! 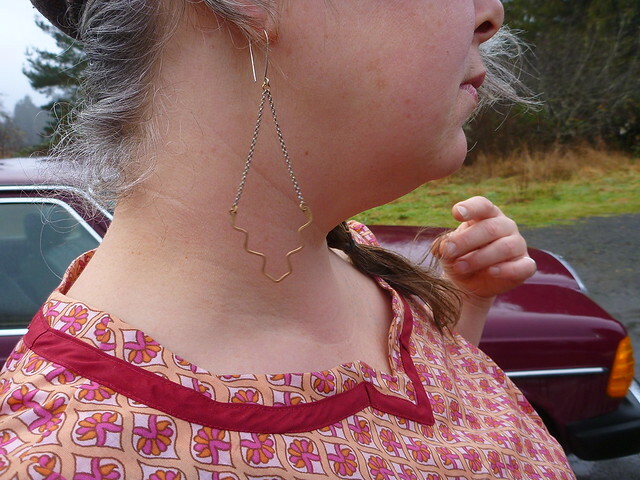 I promise there will eventually be photos of my handsewn items in Dublin, but first I have a couple of garments that I photographed before I left Portland. The first of these, I actually began working on close to a year ago, and finished last summer. 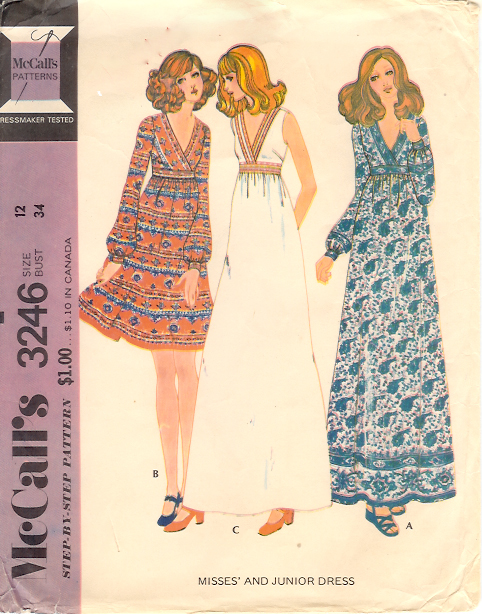 The pattern is McCall’s 3246 from the early 70s. 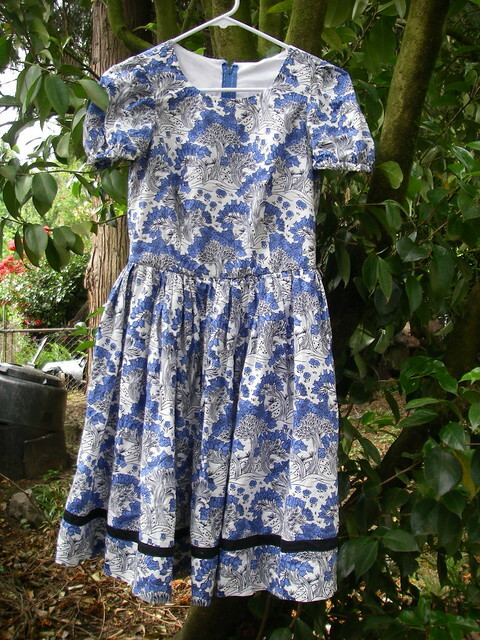 I have made this dress before, back in the days when I thought you just cut a pattern out and it fit perfectly without modification. 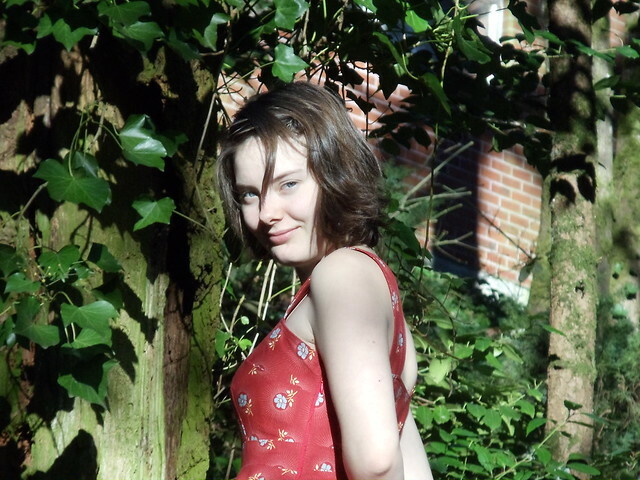 That was the dress that taught me that’s not true (also, that quilting cotton is not always a good choice of fabric). It looked okay in pictures, but I felt restricted and uncomfortable wearing it, and the crossover bodice gaped like mad, so I gave it to my mother to use in quilting. 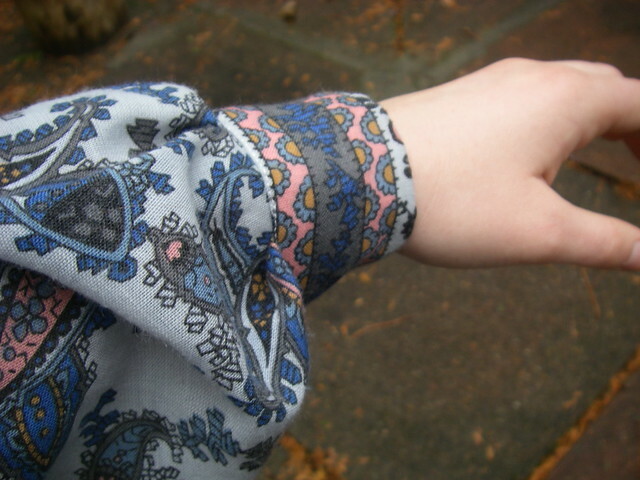 I really liked the idea of the dress, however, and when I was given this crazy poly/wool paisley border print, I knew it was meant to be. 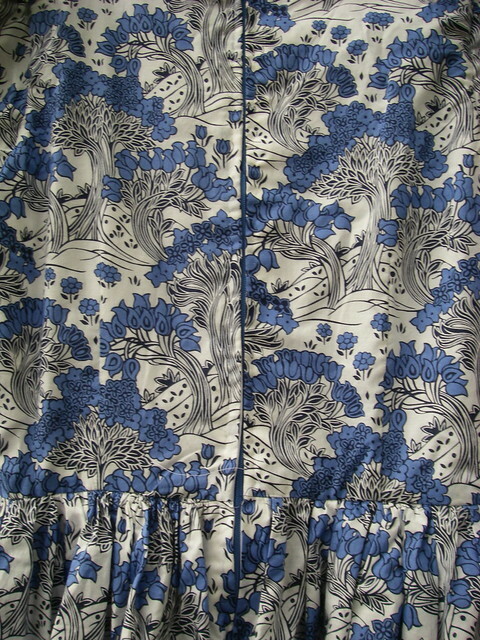 The fabric is very loosely woven and pretty sheer, so I underlined it with a poly cotton bedsheet. Given that I had actual 100% organic cotton bedsheets lying around, this was a dumb choice. The underlining was stiff and hated to take a press, while the fashion fabric was floppy and unstable, and also hated to take a press. Consequently, my darts are a bit, well, lumpy. Luckily, this fabric hides all the flaws in its mad pattern. 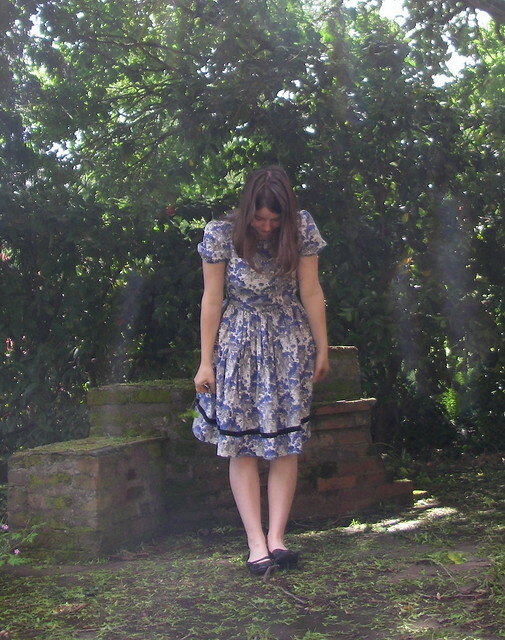 I did make a muslin for this dress, but be warned, dear readers: if you don’t do a muslin right, it is a waste of time. I didn’t put sleeves on my muslin, which would have alerted me to all manner of problems. I also didn’t put a waistband on my muslin. Lastly, I made too large of an FBA, but rather than addressing this directly, I just sort of pinned the bodice front pieces together where it looked least bad. It was all very foolish, as I realized when I stood in front of the mirror a couple of months later with a half-made bodice in my fashion fabric. I lengthened darts, I shortened darts, I lengthened them again… in the end I did an SBA to my altered pattern piece and carefully cut the new bodice piece out of the old bodice piece. It was a mess! • I took a total of two inches (I think!) out of the bodice width, and altered the waistband accordingly. The bodice is fine but the waistband is a bit snug so I must have done something wrong. • I made the skirt a lot shorter, thinking I would be wearing it with rubber boots (I prefer to wear rubber boots with miniskirts). 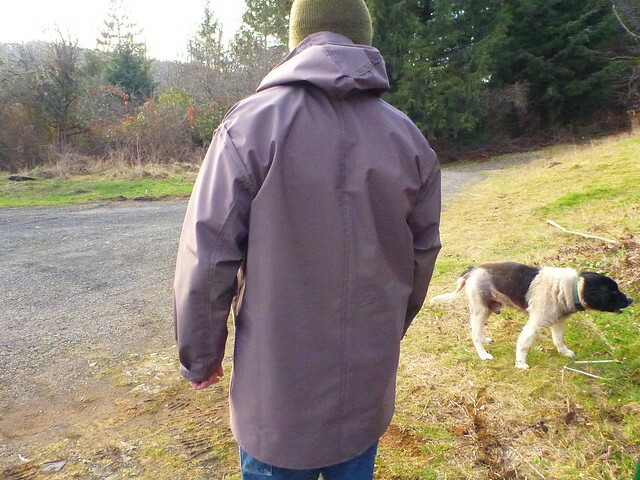 I have yet to wear it with rubber boots but I do like the length! I will admit I don’t love this dress. I feel super cute in it and I do wear it sometimes, but the fit is still weird, especially with the sleeves and the slightly-too-tight waistband. The polyester also gets pretty gross to wear in humidity, but I live in a humid climate… all this combined means I don’t reach for it too often, unfortunately. 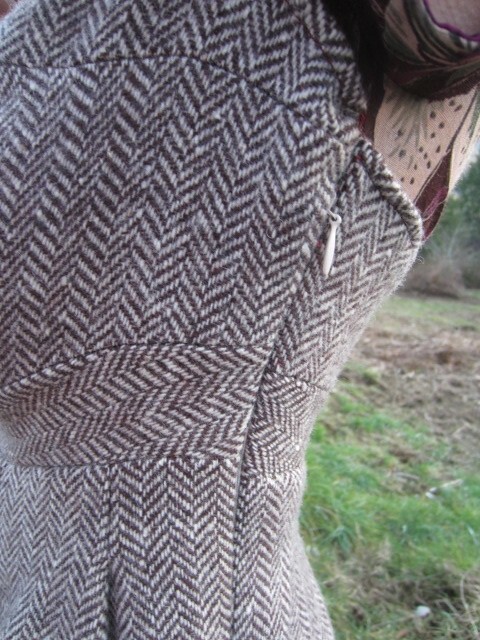 Here is a detail of the crossover bodice and one cuff. The sleeves and cuffs of this dress are probably my favorite thing about the pattern. I tried to have a bit of fun with this photoshoot (if it can be called that…) since photos are fun and I hate looking awkward in front of a camera. If you don’t feel awkward, you don’t look awkward! Still, I’m always a little worried that one of my roommates is going to look out the window and see me posing by myself in the backyard. 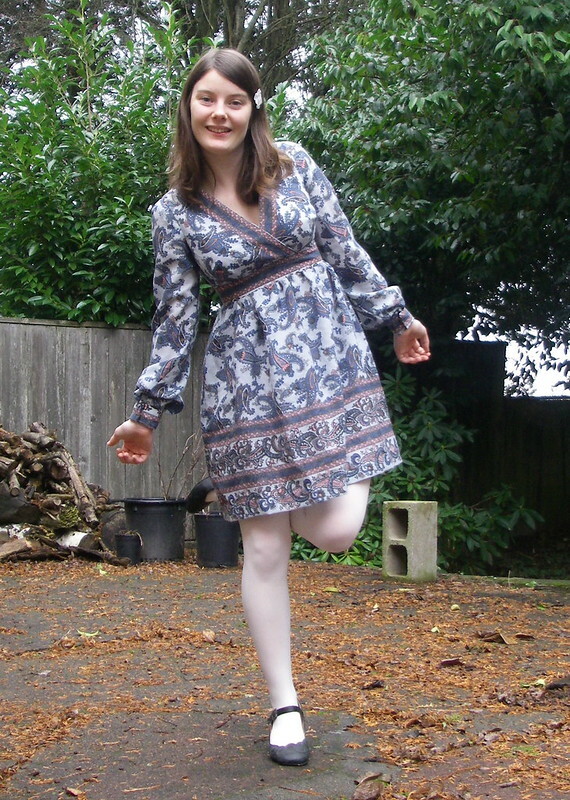 This entry was posted in sewing and tagged dress, sewn, vintage on January 17, 2014 by Alice. Well, I’m back! 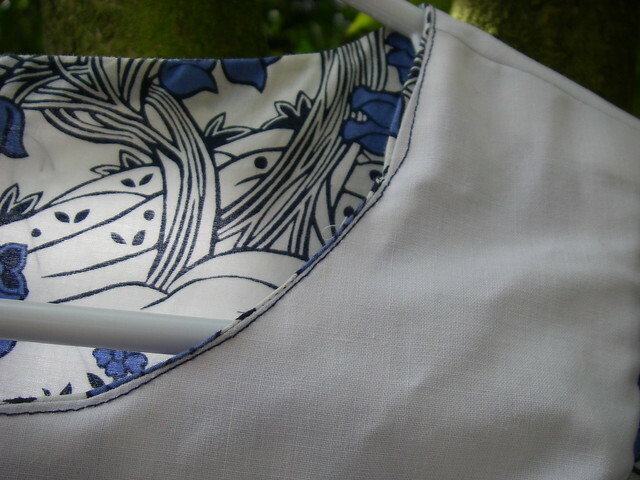 What with school and all, I’ve hardly had time to sew, and it doesn’t help that both of my sewing machines are broken! I did make a Secret Santa present using the sewing machines in the costume shop, but other than that I haven’t been able to sew since I don’t know when. 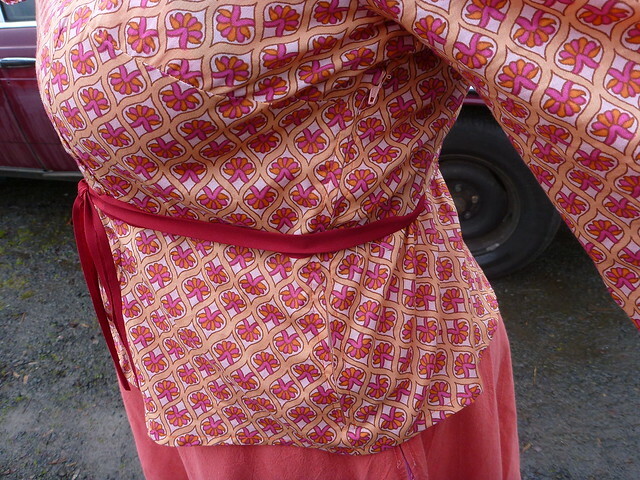 Now we’re in the middle of winter break, though, and I’ve been out in the country using my mom’s fancy Juki to make her an Alma blouse! I cut a size 16, going by Mother’s upper bust measurement, and did a full bust adjustment. At first I added a total of three inches to the bust, but after the first muslin, I had to reduce the bust by an inch (interestingly, this happened with the last FBA I did as well–I’m really not sure why). 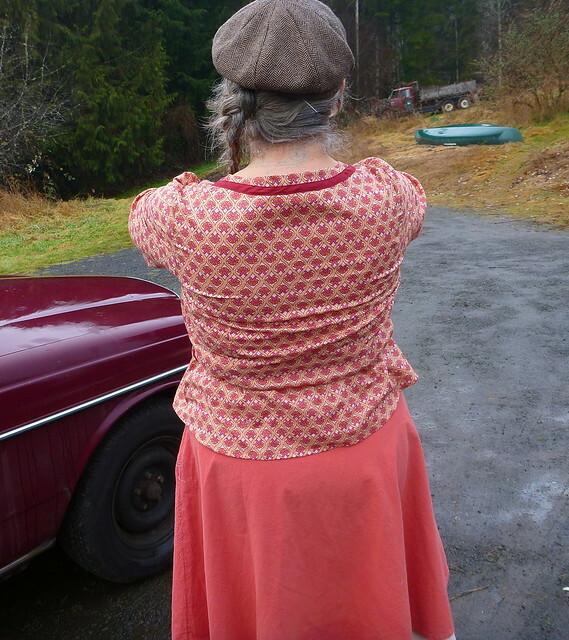 I also did a forward shoulder adjustment of probably 1 1/4″. I had a lot of trouble fitting the sleeves, and as you can see, they’re still not quite right. 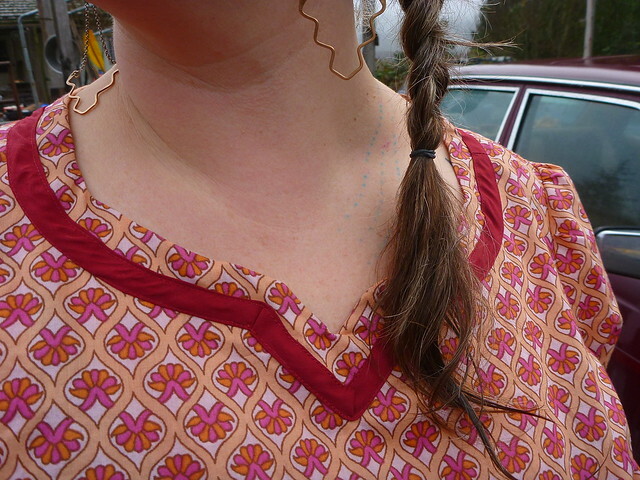 I narrowed the shoulders by about 5/8″, and put that fabric into the sleeve cap instead. I also did a full arm adjustment, and cut the sleeves on the bias. They fit a lot better in the lawn than they did in the poly-cotton sheet I was using for the muslin, and Mother can move her arms pretty freely, but I’m still not entirely satisfied. Sleeves are hard! 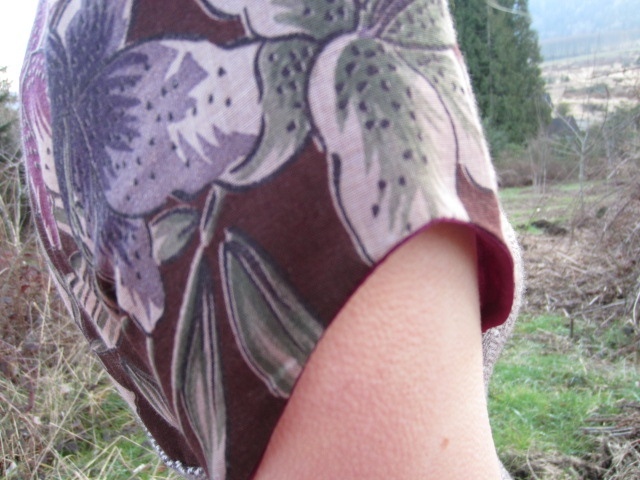 In addition to changing the sleeve length, I gave the sleeves a little notch that matched the neckline. 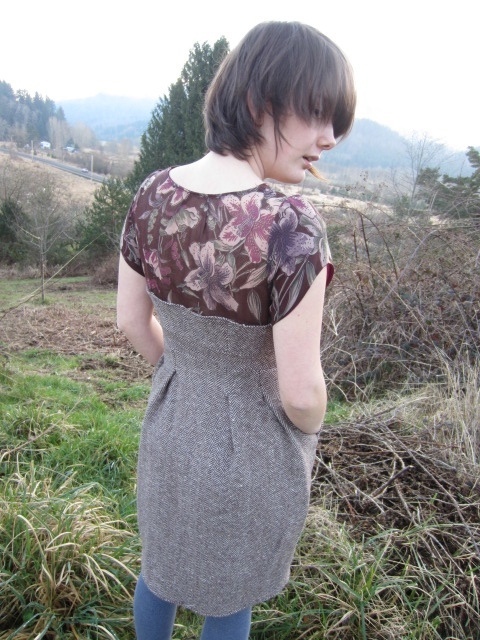 I trimmed both sleeves and the neckline with some homemade burgundy bias tape. 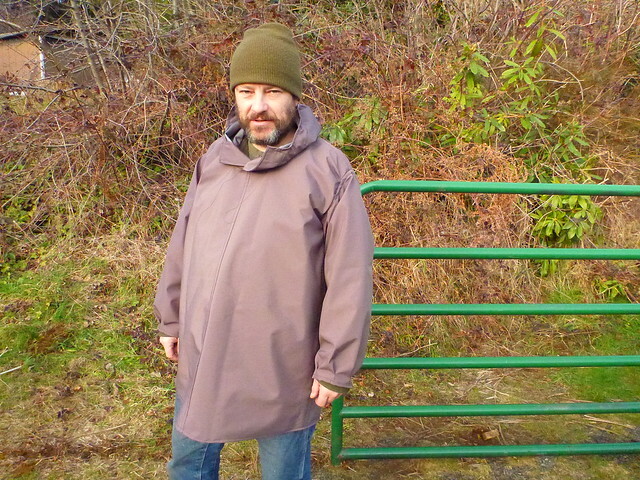 I used a regular zipper instead of an invisible one, for no particular reason. It is still pretty discreet. The belt shown here is the leftover burgundy bias tape. I also made the skirt that Mother is wearing, which was last year’s Christmas present. It is something like a quarter circle, made out of something woven but stretchy from Fabric Depot. 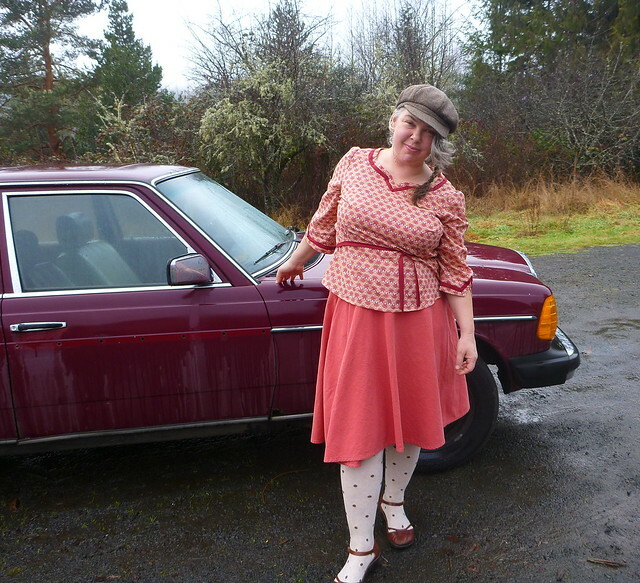 It matches the blouse perfectly! I’m going home tomorrow with a borrowed sewing machine, to sew like mad until I leave for Ireland in a week! I’m hoping to make a shirtdress, two circle skirts, and to finish the Macaron I was sewing when my machine broke. And if I can accomplish all that, there’s a million other things I’d like to sew…but I’m trying to keep my to-do list short! 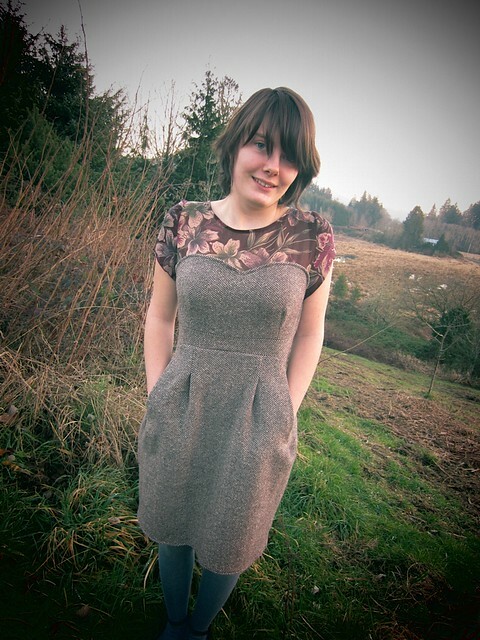 This entry was posted in sewing and tagged blouse, for meeker, sewn on January 1, 2014 by Alice. The moment I saw the Joel Dewberry Floral Drop pattern (used in three different colorways in this quilt!) I knew that I wanted a dress out of it! 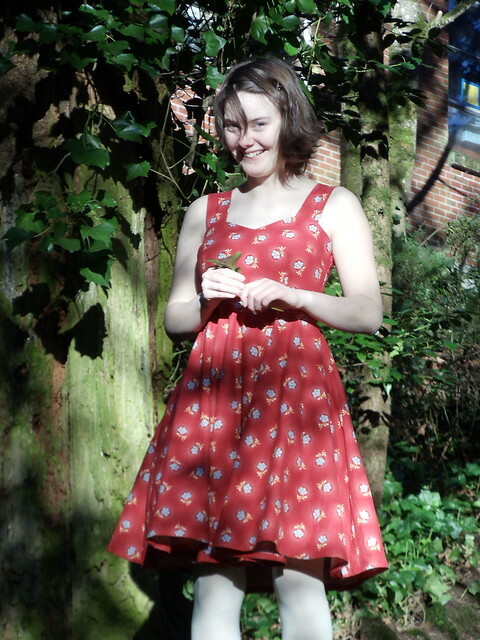 Never mind that it’s quilting cotton, it HAD to be a dress for swing dances and ceilis–even in January, you can only wear sundresses because it gets unbearably hot, and the best sundresses are twirly ones, because what is dancing without lots of spins? Less fun, that’s what. Luckily, the fabric store in Astoria had the red colorway on sale, so I bought a couple of yards it to make my dream dress. And it is such a dream dress! Let me tell you, I want five of these dresses, in a variety of beautiful prints, to wear in all seasons to all dances and classes and parks and dates. 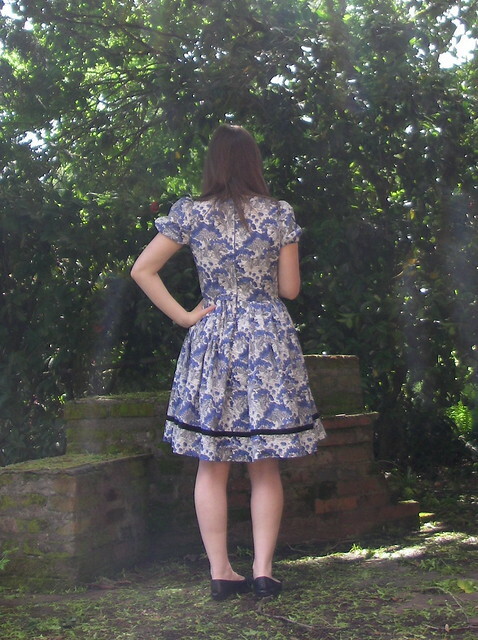 It is so comfy and pretty, and the fact that it’s quilting cotton matters not a bit–it actually makes it better, because it gives the skirt some stiffness without needing a crinoline. 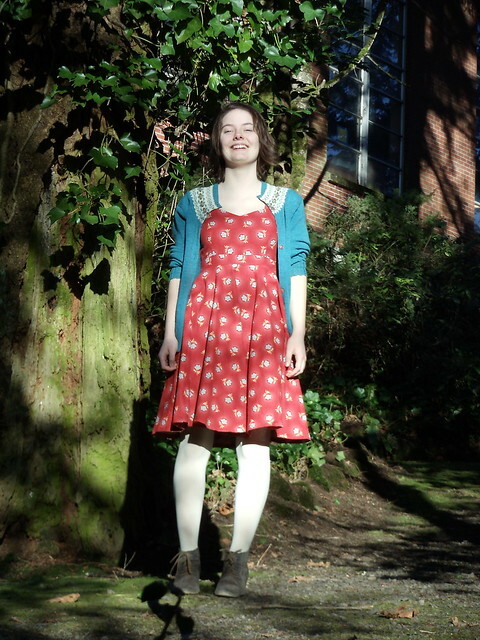 It’s a fantastic sundress, and if it’s chilly, I can just wear a sweater and tights! 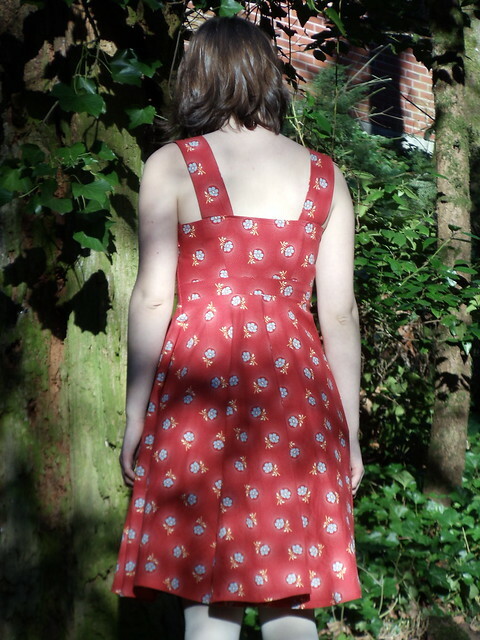 I knew I wanted a sweetheart neckline (I have admired them for ages, but never had a dress with one until my Macaron), so I used the bodice from the Macaron pattern, sans yoke. I had to take it in at the sides, and make it higher front and back to cover my entire bra. It took ages to alter it just right, and foolishly, I didn’t trace my finished product out on pattern paper, so for the next dress, I’ll have to figure it out all over again. Oh well. I wanted a full skirt, because it’s a dancing dress, and I used a circle for maximum twirliness. I didn’t originally buy enough fabric to finish the circle, so the project was put on hold for a couple of months until I had enough. It twirls excellently! The back. My straps are quite wide–perhaps a little wider than they need to be, but I wanted to be sure they would be stable and cover my bra straps. From the side. I put this zipper in and ripped it out twice before realizing that I’d been doing it right the whole time. After that, I didn’t have the heart to take it out again and try to make it properly invisible. I don’t think I’ve ever done a zipper well–I’ve done two in the last week or so and neither of them came out very well, though I’m probably the only person who will ever notice. Maybe in the future I’ll just handpick them all. 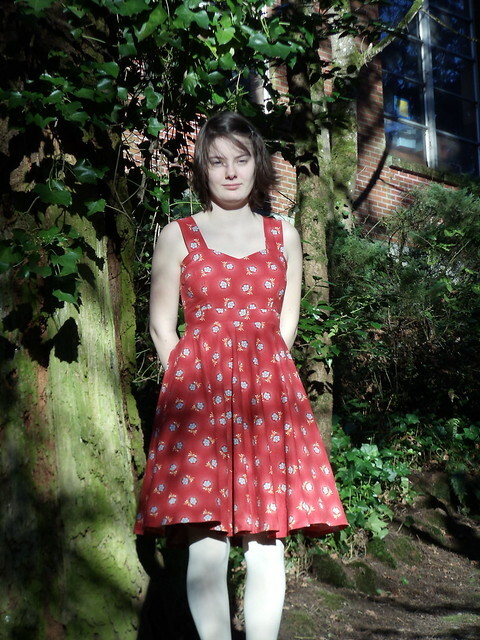 I also hemmed this dress twice. I cut it out sloppily, thinking that I would take off length once I’d tried it on, but I liked the length so I didn’t trim it down at all, I just hemmed it. 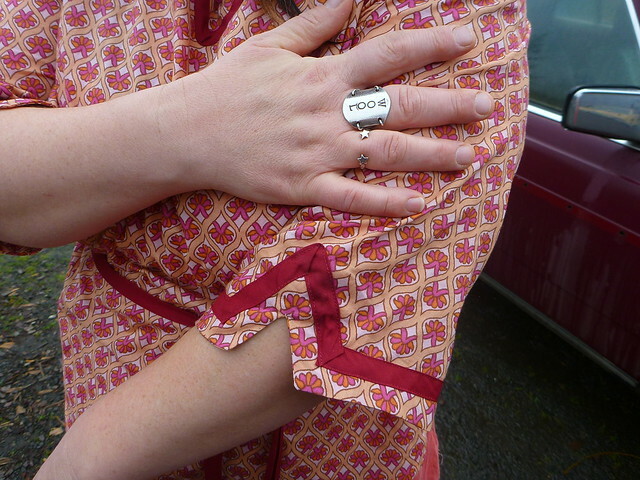 I didn’t notice anything wrong, and wore it around one day, and then dancing a few days later (I got a very nice compliment from someone, who was very impressed when I told her I had made it and wanted to know if I’d used a vintage pattern! ), but when it was hanging in my closet afterwards, I noticed that it was not even at all… so I had to rip it out, trim off about an inch from places in the front, and do it over. It’s just a machine hem, luckily. In the end, I decided I like this length much better, it feels like a much more reasonable amount of fabric for some reason. 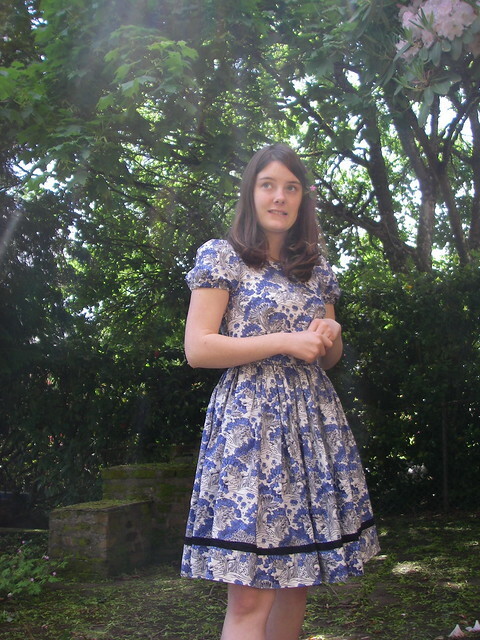 This entry was posted in sewing and tagged colette macaron, dress, sewn on March 10, 2013 by Alice. I bought Colette Patterns’ Macaron pattern on Black Friday, when all of their patterns were 30% off. I had coveted Chantilly for a long time, but Macaron is such a sweet pattern with a lot of room for variation, and a bit of a break from my normal full-skirted silhouette. I didn’t end up saving that much money, since shipping turned out to be about 30% of the pattern price, but my Macaron arrived in the mail a short time later, in an adorable pink booklet! Then it sat on my shelf while I frantically packed and sewed Christmas presents (for the most part undocumented, I’m afraid) and took my finals. I brought it with me on break to my parents’ house, where it languished in a paper bag while I made a quilt (more on that later). I had brought with me a few yards of brown herringbone wool rescued from the Bins (a terrifying place, but lots of very cheap fabric if you care to find it). I didn’t really have any plans for it, and had only brought it because it didn’t fit conveniently in any of my boxes. I thought about making an a-line 60s miniskirt out of it, or a vest, or something. 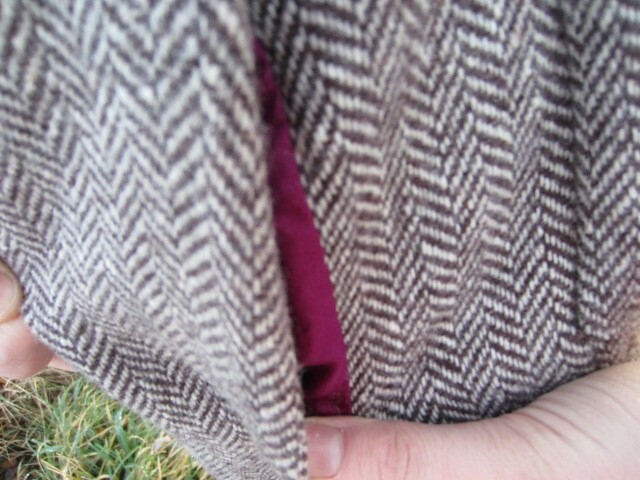 However, going through Mother’s suitcase of apparel fabric (most of which she has given to me), I came across a lovely sheer burgundy and brown floral, which, held up to the herringbone, cried out to be my first Macaron. 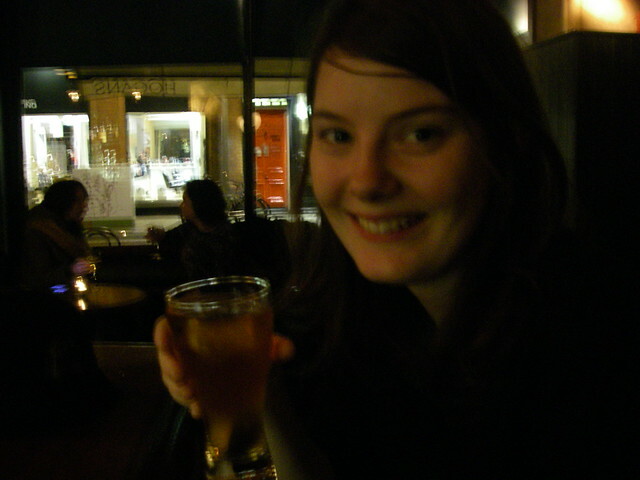 Newly enthused, I set about muslining! 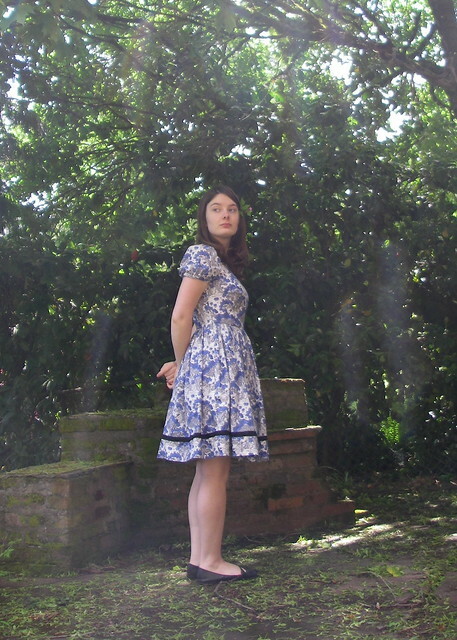 I have made things from patterns, but they have either turned out ill-fitting (as in my green blossom dress), or needed no alteration (as in my corduroy Burda skirt). I had never altered a pattern to fit me, and didn’t really know how to go about it. I made three muslins before I was finally happy enough with the result to make it up in my fashion fabrics. I shortened the bodice pieces by 1″, narrow-ed the back by 1″ (tapering off to normal at the waist), deepened the armscyes, widened the waist by 1/2″, shortened the entire bodice by an inch (I think I’m a petite size, technically), and did an FBA! The last is really the exciting thing. I’d never done an FBA, and had really hoped to avoid it since Colette patterns are drafted for a C cup… but alas, ’twas not to be. The pattern piece was not meeting in the middle, so I pulled up a couple of tutorials and started drawing lines all over my pattern. (I traced it, don’t worry.) 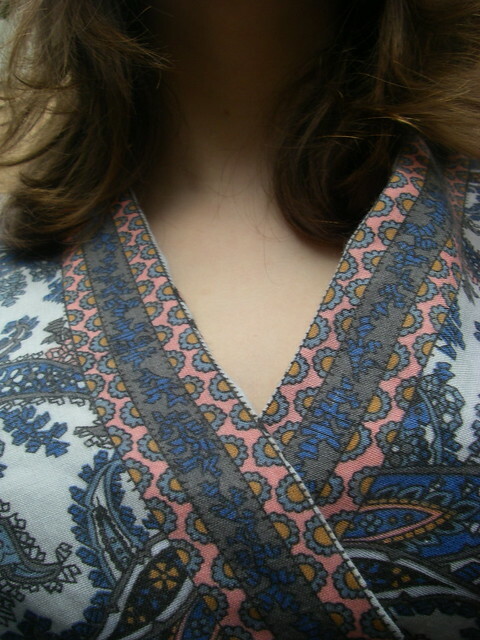 It fits much better now, happily, though I can’t say I’m thrilled to have to do that with every pattern I make. 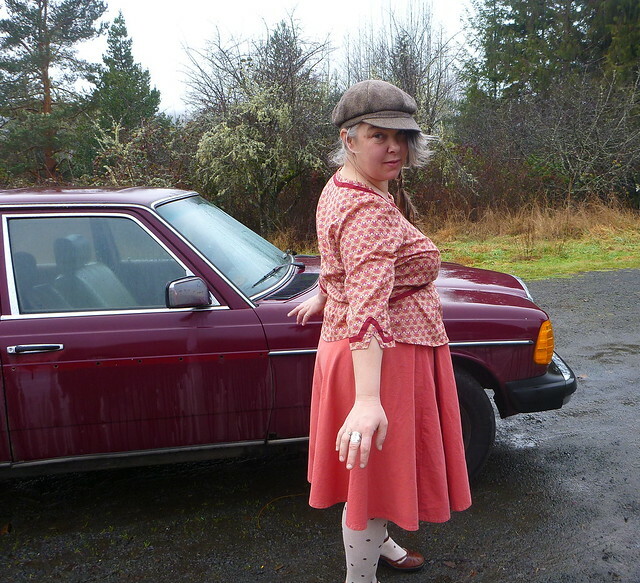 A little too much fabric in the back yoke, but the skirt pleats look fine despite my apprehension. With my next Macaron, I think I will have to alter the armscye in order to get rid of the excess fabric in the yoke (though you can’t see it so much in these pictures, so am I imagining it?). I deepened it here, which didn’t really solve any of my problems and resulted in it looking a little silly. 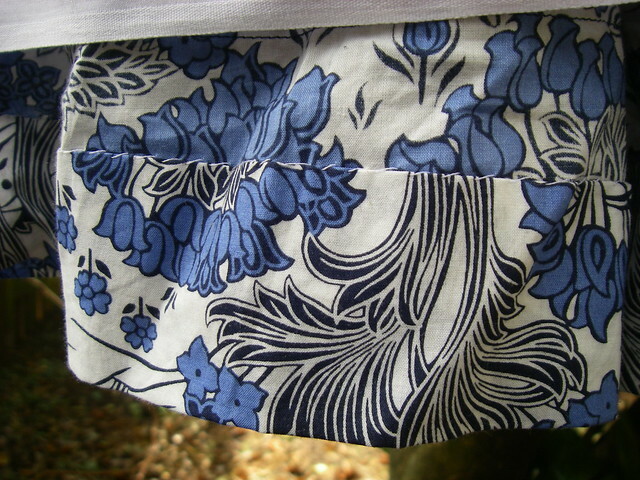 And the pockets are silk too! I won’t be able to put anything heavy in them, but any pockets are a luxury. My invisible zipper is invisible this time! The waistband doesn’t line up though, so oops. 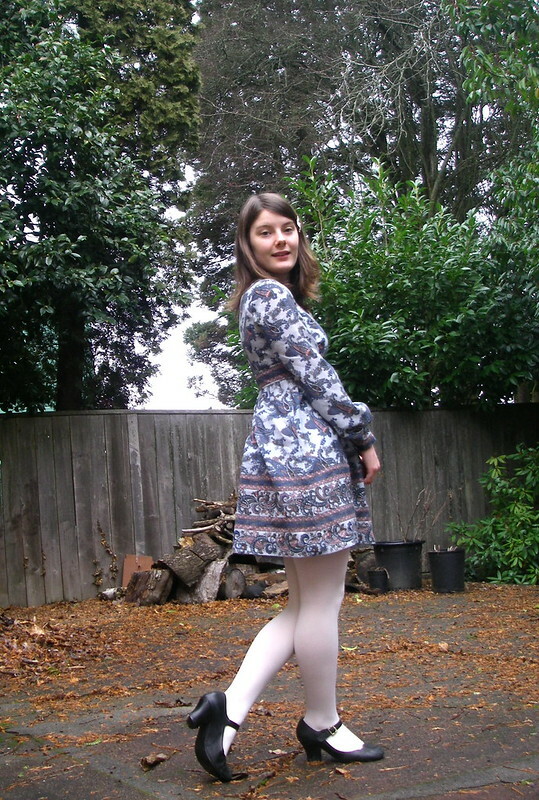 In conclusion, I’m pretty happy with this dress, though it’s not perfect. I had some issues with the different types of fabric, which were all unstable and tricky in their own special ways. Some of my pattern alterations didn’t really work, and some of them worked but not well enough. But, it’s the first pattern I’ve ever altered, and it’s quite pretty, considering. I wanted the insides to look really nice, but they don’t, particularly. I should go back and bind them with bias tape of purple silk, but that stuff is hellish to cut so I seem to be putting it off. 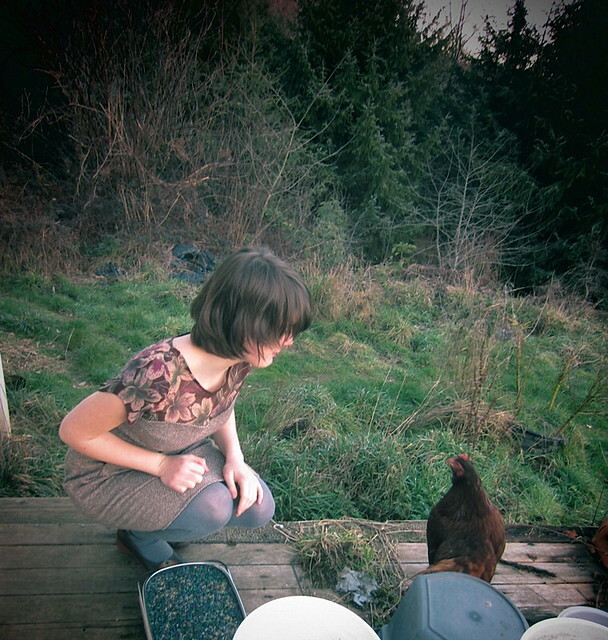 No country home is complete without a pet chicken. 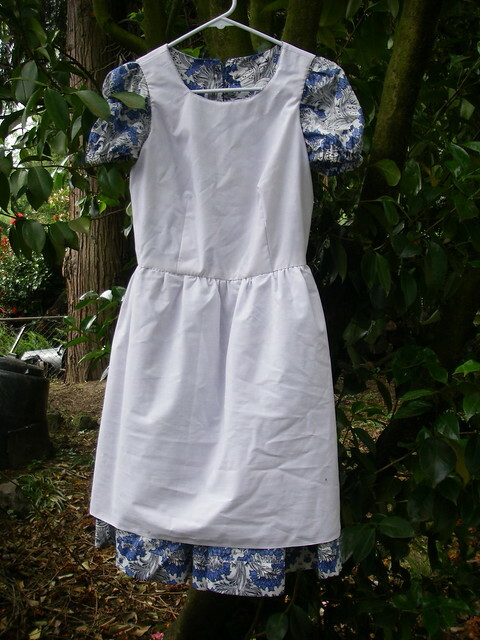 This entry was posted in sewing and tagged colette macaron, dress, sewn on January 16, 2013 by Alice.